CHATTANOOGA, Tenn. — As federal prosecutors wrapped up their case against him Jan. 31, former Pilot Flying J President Mark Hazelwood opted not to testify or present witnesses on his own behalf. “We strongly believe the government has not proved its case,” defense attorney Rusty Hardin said on Hazelwood’s behalf Jan. 31 in U.S. District Court. Assistant U.S. Attorneys Trey Hamilton and David Lewen rested their case Jan. 31 against Hazelwood and three former subordinates — former vice president Scott “Scooter” Wombold and former account representatives Heather Jones and Karen Mann. The quartet have been standing trial in U.S. District Court in Chattanooga since November on charges including conspiracy to commit wire and mail fraud in connection with a five-year scheme to trick trucking companies into loyalty agreements with the truck stop giant by promising them big rebates they never intended to pay in full. Hazelwood is also charged with tampering with a witness, his former executive assistant Sherry Blake. Wombold is additionally charged with lying to the FBI and IRS Criminal Investigation Division when agents raided Pilot Flying J’s headquarters on Lonas Drive in Knoxville in April 2013. 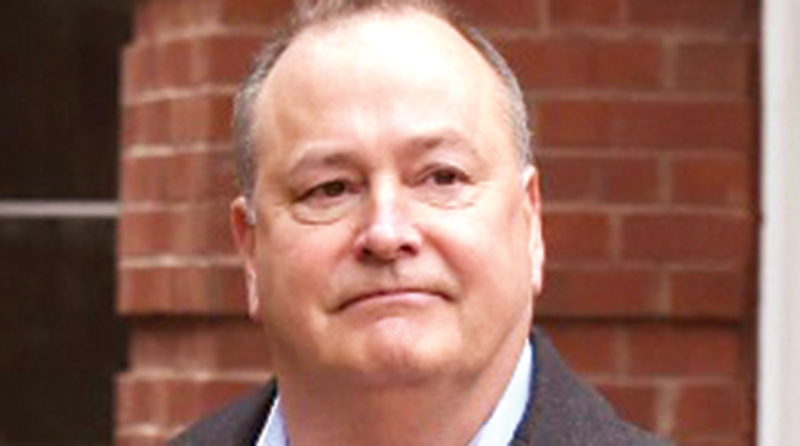 The prosecution rested without summoning to the witness stand former Pilot Flying J Vice President John “Stick” Freeman, whose braggadocio about the massive fraud scheme was repeatedly captured on secret recordings. Freeman pleaded guilty just months before the current trial began. Freeman, testimony has shown, was close friends with Pilot Flying J CEO Jimmy Haslam, and Haslam’s voice was captured on one of those recordings referring to an incident in which the firm’s board bought a worthless airplane from a trucking firm after the firm’s owner learned Freeman had been cheating the company in promised discounts. That fraud, which involved Western Express in Nashville, occurred before 2008 and was too far in the past to allow the prosecutors to file charges specific to it. Haslam has denied any knowledge of the fraud scheme and is not charged. Pilot Flying J’s board has confessed criminal responsibility and shelled out $92 million in criminal penalties, $85 million in lawsuit settlements and is funding the hefty defense bills for its former staffers, including Hazelwood. Freeman is among 14 former executives and staffers of the truck stop giant who have admitted scheming to boost Pilot Flying J’s market share and profit by luring trucking firms in as customers with promised discounts on diesel fuel purchases and then secretly shortchanging them. Also not called as a witness by the government was its own mole — former sales executive Vincent Greco. He and one other former staffer were granted immunity to garner their secret cooperation in 2011. Greco secretly recorded three Pilot Flying J sales meetings — one of which was mandatory for all sales employees — in late 2012 and early 2013 at which the fraud scheme was discussed and, at that mandatory meeting, taught to other staffers. Hamilton and Lewen played those recordings for jurors during the trial. Those recordings also captured talk by Hazelwood and Freeman about expanding the scheme. Greco also captured recordings of Hazelwood and his sales executives making racist comments, using racial epithets, mocking the Haslam-owned Cleveland Browns, its fans and members of Pilot Flying J’s board of directors. In a legally controversial move, U.S. District Judge Curtis Collier allowed jurors to hear snippets of those racist recordings in which Hazelwood asked his subordinates to play a racist country song, to which Hazelwood and his subordinates sang along. USA Today Network - Tennessee — along with other media organizations in Knoxville, Chattanooga and Cleveland — is pushing Collier to unseal the entirety of the recordings, transcripts and all related motions about the recordings. He has not yet ruled. Hardin on Feb. 31 again asked Collier to declare a mistrial over the playing of snippets of those recordings, but Collier stood firm on his prior ruling that Hardin himself opened the door for the introduction of the recordings as evidence by painting Hazelwood as too savvy a businessman to do anything, including commit fraud, that would damage the reputation of the nation’s largest diesel fuel retailer. Although Hazelwood isn’t summoning witnesses, Wombold’s defense team Jan. 31 sent forensic accountant William Jennings to the witness stand to try to downplay just how much the fraud scheme put in Wombold’s pockets. Jennings’ firm is being paid — by Pilot Flying J’s board — $250,000 for his review of the commissions and profits generated by the defrauding of six specific trucking firms. Testimony has shown, though, that more than 100 firms were cheated. “So you spent 1,000 hours looking at (six) customers — $250,000 for six customers?” Hamilton asked on cross-examination. Attorney Eli Richardson told Collier Jan. 31 that Wombold’s defense team will seek on Feb. 1 to play a portion of the secret recording. He gave no indication that any other witnesses would be called Thursday, including Wombold himself. Attorneys for Mann and Jones have not yet revealed whether they will present witnesses or whether the two women — who handled paperwork for the sales executives that included evidence of the fraud scheme — will testify.